Moving into the character concept development phase and it’s been going pretty well. Starting to see how the players will take to the stage and height differences. E.g. where does someone’s elbow line up next to another character. Also, nice excursion to a local Japanese tea house will get the creative hubbub roaring. Highlights included Pu erh, Lapsang Suchong, and a nice matcha. Yes, that’s three teapots going at once. Working on secondary characters. This otter-ly friendly character is going to appear more on the second half of the novel. Worked through preliminary sketches for general personality and facial expression. Main emotional palette is bouncing between happy/laughing/smiling, ADHD distracted, and at times melancholic. Great character to really get a chance to do justice. 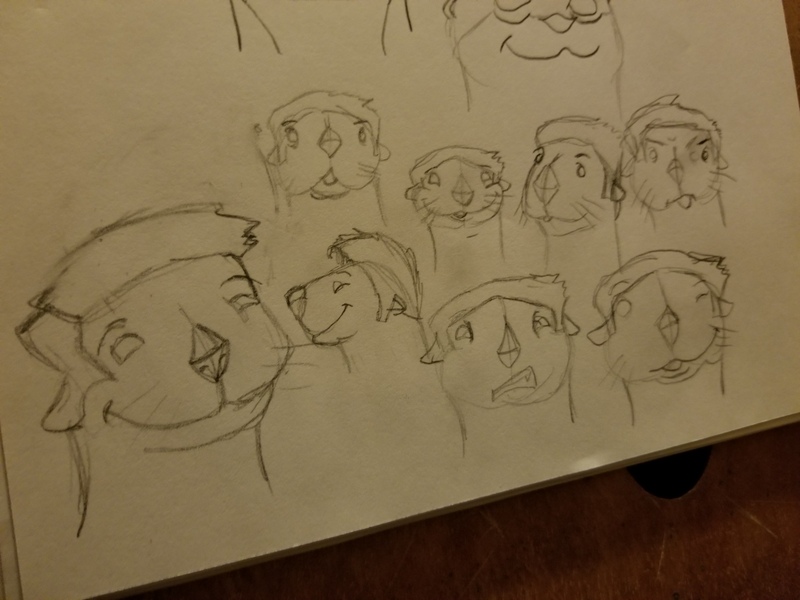 The otter’s sideburns is befitting. Of all things that are most dubious, daunting or otherwise… none compare to the storline. If your jazzed about it, the complexity and excitement shows. If it’s just straight ‘meh’… it will get amplified. And if you’re in my boat…it’s downright terrifying (but in a good way). Consider your own fears (for better or worse) an excellent reason to get motivated or view them as an opportunity for some good ol’fashion introspection. With the right amount of the stuff and harnessing it correctly, fear (or rather the urge to overcome it) can prove a to be a powerful ally. Stepping Up to the Plate: The Storyline The storyline for the graphic novel of my mine is just about laid out. Some authors use post its, cue cards, notecards…or just binders of scrap paper thrown together. Use whatever the method works for you. 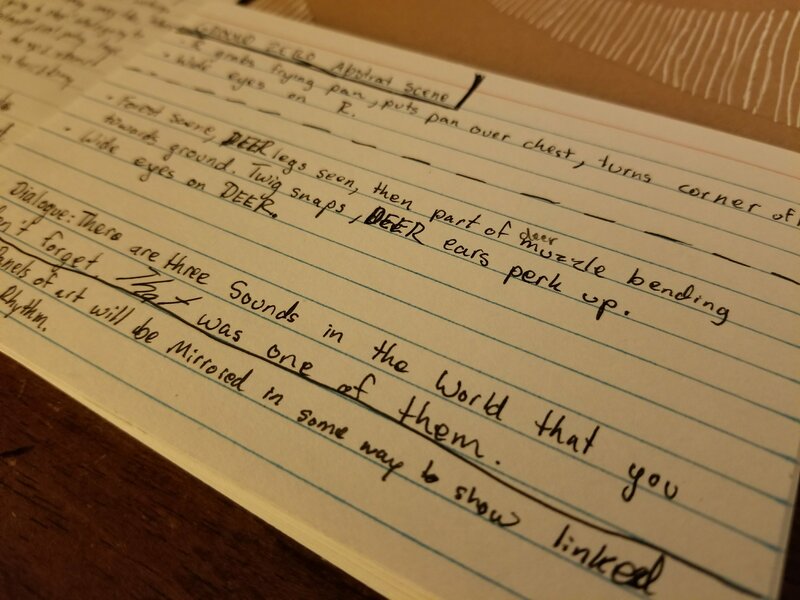 Those little index notecards just happen to be the right size for the sections of the narrative. Some sections happen to be more full, others… not so much. But good writing should be a blend of both a slower pace sequences matched near faster paced. Consider your favorite piece of writing (or yarn, flick or graphic novel). There’s a pacing, a rhythm, a sort of melody in the way events and characters happen. 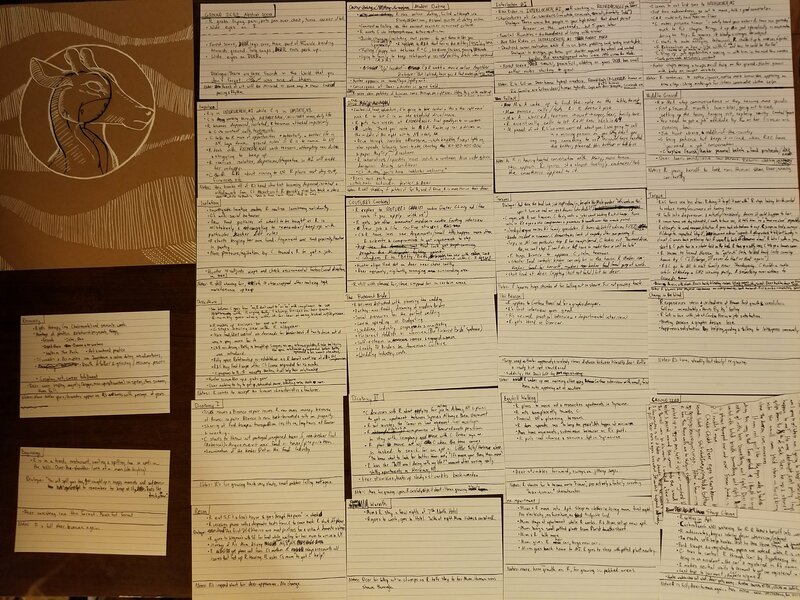 The cool thing about index cards is that you can shuffle them around and rewrite or reorganize them without getting too overattached to them*. The flexibility is a happy sandbox for which you can really play around with. The next two weeks will be interesting to say the least as I’ll be colliding worlds with the reinvigorated journey on creating a graphic novel. Currently setting down plot, character, theme, and narrative parameters. Scripting down key plot points. Going to be an interesting and long, long trek to say the least. The “Dear” graphic novel project is making slight head-way as an upcoming production session has been scheduled for late December 2016 through early January 2017. Below is a recap of past sketches, thoughts and other ephemera that’s been floating around in this brainpan of mine. “Its been a while since i posted (life got in the way) but heres to hopefully a new year chocked full of progress shots of an upcoming long term project that is waaaay overdue and needs to get out of my system. Above snapshot: pen and ink warmup and sketching study of deer. The long-haul visual design project that is now in my creation queue is a graphic novel. It’s taken the better part of four years to be able to step back and be able to tell an un-compromised story accurately but just recently there was a turn and catalyst about a month or two back(namely a few friends + supporting characters that you’ll see in days to come). About a few days ago, I stumbled across this gem of a youtube video from the excellent crew over at Extra Credits (long time fan of the show BTW) that covers the very basics of starting to create your own video game ( as well as thoughtful questions to ponder and advice before jumping in headfirst ). A lot of practical applicable advice (e.g. don’t expect a Hollywood-esque result if it’s your first go but be proud that you’re actually making something) and just in time with regards to what I’m working on. I highly recommend it to anyone who needs a wee bit of motivation and a very rough set of organization tips to keep whatever you’re doing on track. Just a quick snapshot of the sprawl that’s been over my workspace and a teaser of a WIP anthropomorphic creature that I’ve been in the middle of working through ( as well as glimpses into the chaotic thought process of filtering through what needs to go in the story and what doesn’t). There are two large hand bound sketch pads that I’ve had for a quite a bit of time (and holding on to for good reasons) and this foray into the project seems a good use for them. 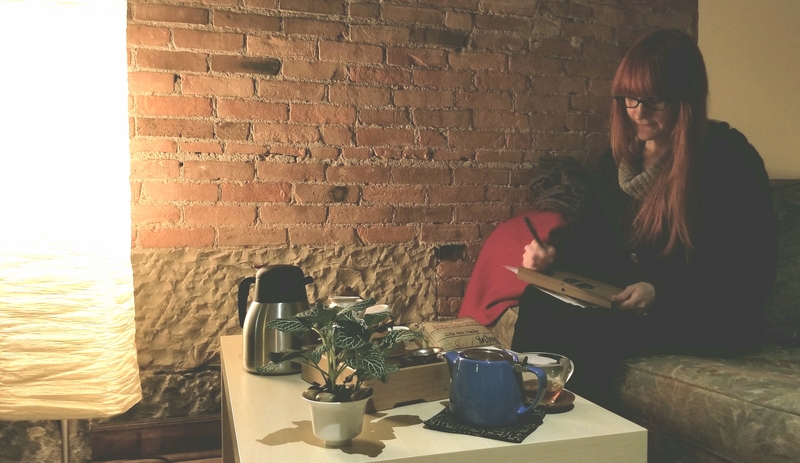 For those at home keeping tabs on this blog, the next year’s worth of posts are being dedicated to recording sketches, final pieces of illustration work and sequential art pieces. The (zealous) goal is aiming to finish a graphic novel in a year (as this is a long overdue project). Some future material may not be suitable for certain audiences so I’ll do my best to leave warnings. 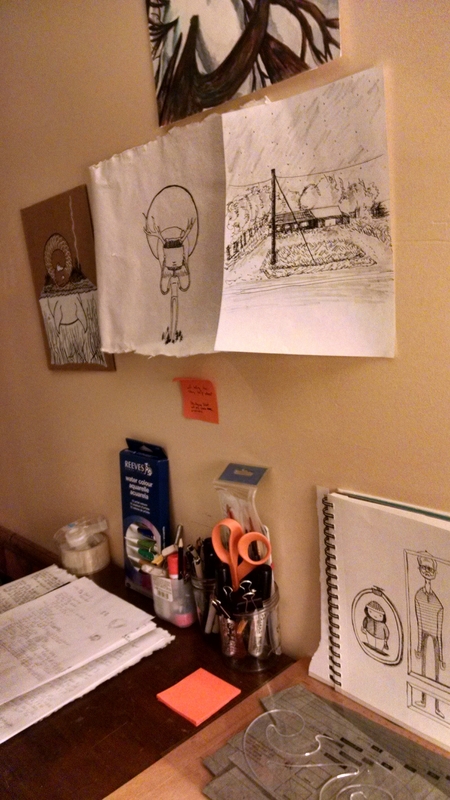 Anthropomorphic art: after reviewing past personal sketches, drawings an illustrations I realized that a common theme of more ‘finished visual thoughts’ started to emerge: the use of anthropomorphic imagery and subjects. It didn’t help that a few months ago, I was introduced to Misao Kinoshita’s mythological sculptural works that explored (and how!) the musculature structures envisioned for more well-known mythical & fantastic creatures. A portion of the novel seems to be gravitating towards this theme and its quite intriguing to question the use of it (especially in contexts of visual narratives in general). From the git-go, if you were to ask what is the first thing that caught your eye if you picked up a graphic novel or comic book, it’s going to be the characters (one dimensional or well rounded). This is just a quick warm-up practice sheet of just general facial expressions and a conscious effort to see the human form in an almost sculptural way. E.g. how does the nose change when looked from up above? Down low? What micro expressions on the face do you see when you mix fear and anger? Updates on narrative direction coming soon. Just a quick snapshot of a some of today’s sketchbook character expressions/designs fun. One of the potential main characters will probably be a modified version of this. Just how much … That’s going to be the hard part as this character is set is directly based off of the whimsical, otterlike playfulness that David Tennant exudes. A quick WIP piece that is an experiment in use of line and color blocks on cardboard. The crown and use of solid white with black outline near larger bodies of white (no outline with use of the brown toned paper) is proving to be aesthetically balanced. This piece is a reference style study for what’s to come potentially. I was able to get the chance to read B.P.R.D. (an offshoot off of the Hellboy series) and just happend to fall in love with a small vignette of a story right at the end of vol. 3 involving a Wendigo creature named Daryl. The yarn is told via flashback as a “sad ghost story” and does a very good job exploring the legends and mythos of the Wendigo creature. The concept of the ‘creature’ within us all and just what triggers this beast to consume/dominate/overtake us is a critical element on where my current work is heading. Questions of where does one stop becoming ‘human’ or ‘normal’ In today’s modern world and how does one cope or confront issues (personal/community/etc)? Is the ‘creature’ that we become our curse or an unapologetic mechanism of either progress or devolution. And where does that fine line lie? More experiments with block white highlights near stronger line work while sketching hands. Of all the items on the human body the hands (and to a certain extent the lips) are the punctuation in the visual statement of body language. Thoughts to chew on while sketching. A very quick and dirty sketch of one of the main places the graphic novel is to take place. Most of the detail is taken from memory. The way the grass sloped up and the neat tree line flanking the rear and left side of this particular building. I haven’t been near this site in about four years…so needless to say.. a field trip might be in the cards soon. I know that there are a few angles of the building that I personally never saw but would like have done that would compliment the style I’m heading towards. Side thought: They say that when your trying to “sell” anything fantastical or non realistic (illustration or drawing wise or even in a narrative) that there has to be either in the environment, characters, or objects/ideas something that the audience can relate to. Either it’s as small as a common item found in our world to the language / slang heard. Where I’m heading… It just happens to be human personality coupled with a somewhat familiar American homes. Before we go all Freud-y on this subject, if you’d ever seen my parents together the above rendered illustration is comically (and painfully) accurate. Curiously enough, the same simplistic facial features and the way that proportions/linework for the upcoming graphic novel project and foreshadows of what’s to come and evolve. The project (so far) has been a simmering and swirling plot of cerebral goo and intrigue. Hopefully the (micron) pen will be able translate what’s flurrying around in my brain. Sometimes getting back into the rhythm of things is like relearning how to speak. You start off rough, learn how to form sounds, piece together some parts and mash up others to form new words and meanings. Drawing or revitalizing a project can be looked at in the same manner. Sketches of tonight’s rainy excursion on forming characters and art direction.